Matt Shriver was one of a few new faces at the front of the top ‘cross races this year and rode to a strong seventh at nationals. The Jittery Joe’s rider is without a pro road contract next year, but he’s turned the unfortunate ending of the Jittery Joe’s team into an opportunity to focus on ‘cross and extend his season with a serious European ‘cross campaign. 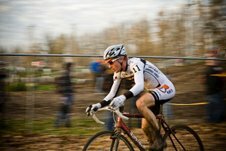 In recognition of his progress and commitment to ‘cross, Shriver has been added to the U.S. cyclocross world championship team. On February 1, he’ll battle Boom and Nys in Hoogerheide, The Netherlands. We caught up with Shriver to learn more about how this dream came about. In the process, he shares some important advice for those who dream of following in his footsteps. CXM: You’re going to worlds! Congrats. Was this a season-long goal, or just a last-minute opportunity? 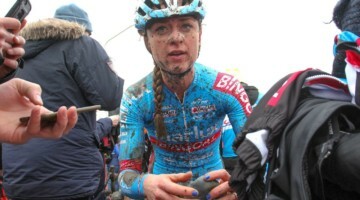 I have always wanted to go to cyclocross worlds. It has been a goal of mine since I started racing cyclocross at the collegiate level. I started to think about going to the Euro Camp and worlds after the USGP’s in Kentucky when I was more competitive and with the leaders the whole race. Then when I found out that I wouldn’t be getting a contract racing pro on the road, I knew I had my opportunity had opened up to pursue a worlds spot. With no early season road commitments, it let me pursue a spot on the team. I knew that it would be an attainable goal after consistently being in the mix at the USGP races. It was hard to not lose focus sometimes after a long road season. When nationals came around, I knew I had to have a good finish to be on the radar. I felt okay that day and got seventh with a strong field. Then I knew that I was one step closer to my worlds goal. CXM: Given that you’re not yet a household name in ‘cross, did you have to lobby hard to get a spot on the team? I didn’t really have to lobby so much. I filed my petition and went to the Euro Camp to gain Euro experience. The Euro Camp is critical to anyone’s efforts in going to worlds. I think there were a lot of racers that petitioned, but didn’t go to Europe. The experience was priceless and it also shows the commitment to wanting to earn a spot. By going to Europe, its shows that you want a spot on the team, but also that you are trying to improve and learn as much as possible before the big show in February. I re-filed my petition with updated results after Europe and let USAC know that I was serious. CXM: Were you confident you would be chosen? When did you find out? I have been in contact with Marc Gullickson but didn’t hear officially until yesterday, Monday. I was basically praying that my performances would be enough. I even went ahead and booked my plane ticket early. I couldn’t afford to wait for USAC to make the decision so I just booked the ticket. Glad it worked out. It was either lose the initial amount if I wasn’t accepted or lose a lot more when I got word 10 days before going over. Flights are now double what they were. My sponsors have been good throughout the season, but Jittery Joe’s has folded as a pro team and there is no budget left. My savings account is gone! 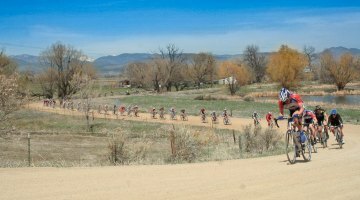 I have done the second half of my season with fund raising from friends, family, and people that love cross and want to help me go. I can’t thank them enough and it has been a huge motivator with so many people behind me. CXM: You achieved your goal in making the team. Now do you have a goal for the race? My goal at worlds is a lofty one. I am shooting for a top 20. That is going to be insanely hard and I will have to have everything go perfectly. This means a flawless start, which is tough to get when starting in the 5th row. No crashes, and good legs. Everything will have to come together perfectly. After racing the five races in eight days at the Euro Camp, I was tired. I didn’t have much training since October. When racing every weekend, you just rest and maintain. I have been getting in some solid training and feeling really good again on the bike. We will see. My other main objective though is to gain valuable experience from competing against the best field of cyclocross racers the world has. 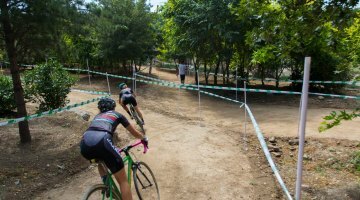 CXM: For next year, any hopes we’ll see you focus on ‘cross? I am working on switching to full time cyclocross for next season. I want to use this year as growth and come back out next year as a top domestic rider. It would be great to keep progressing and go to worlds next year with more experience, more focus and be in the mix with the other Americans. I think it is possible. Van_Dessel MattShriver I did not! Pretty cool!